Racing underway on Sunday on West Neck Harbor by the Sunfish fleet on the Menantic Yacht Club. 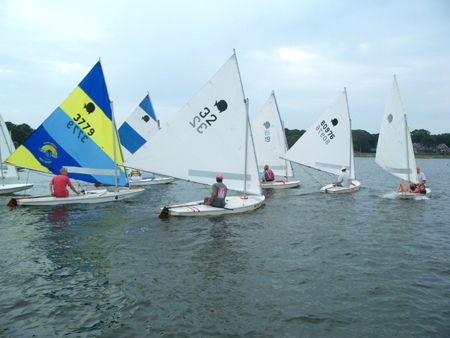 The Menantic Yacht Club (MYC) held its first Sunfish race of the season on Sunday July 1 in West Neck Harbor (WNH). Not only did we have great sailing but the 10 to 18 knot winds caused lots of excitement. The MYC broke a first day of season record with 27 boats and 30 sailors participating. At 1 p.m., Commodore Bethge held a skippers’ meeting. Not much was discussed but we did make one change for the season. This year we will have a protest committee. If you cause an infraction, please do your 360 turn. It is always better to come in a few boats behind instead of dead last plus one. There were no protests this week. One sailor, Cristina Roig-Morris, who was sailing with her son, Luke, left the races after only one race. Luke wanted to watch the European soccer finals and we all know that kids “rule.” You missed a very hard day of sailing, Cristina. The Race Committee held five races. Three were around the usual triangular course and two were the triangle plus windward with a downwind finish. The races were held in the middle of WNH instead of off to the side, which provided better wind and longer courses. During the first race, a power boat hit one of our big neon orange buoys — how is beyond me — sank it and then took off. Shame, shame on you. It was a good thing for the operator of that boat that the bay constable was elsewhere at the time. For the remainder of the races, the committee used the reaching mark for the pin end of the starting line. With the wind gusting to 18, we had a number of sailors flip, several more than once. I hate to pick on any one sailor but Michael Becker flipped five times. At one point, Melanie Coronetz lost control of her boat rounding a mark. Tom McMahon was right behind her and could not avoid a collision. Melanie slipped off her boat and the sheet wrapped around her neck. Being the Good Samaritan that he is, and realizing that he was not going to win that race anyway, Tom promptly took action that saved Melanie’s life. At one point, I was sailing on starboard tack and minding my own business when I was whacked on my head by Jim Kohler’s boom. Luckily my head is filled with concrete. On a side note, Mary Vetri did not flip once, much to the amazement of her niece, Isabel, who was watching from shore. With stronger winds, the boats need to be rigged differently than in lighter winds. The main adjustment is to the gooseneck, which needs to be moved back to the 21- or 22-inch mark, giving the boat better helm and allowing it to point higher. The second adjustment is tightening the cunningham. Lighter sailors, including yours truly, should rig a “Jens Rig” in stronger winds in order to keep the boat flatter but no one did so. During the races, several paddle boarders and kayakers came onto the course. One of the kayaks was struck and flipped over but no one was injured. It is very difficult to see kayaks on the water when sailboats are all around. As I mentioned earlier, we had a record first day turnout and that was without some regulars, Dave Olsen, Charlie and John Modica and Andy Belford. By the way Andy, I have your red hat from last year. Welcome back Debbie and Brant Davison, who arrived in style on their 46-foot Grand Banks along with daughters Amy and Megan, who is an officer in the Coast Guard. Taking a first place in a dinghy race with stiff competition has been on Brant’s lifetime bucket list and he succeeded on Sunday. Way to go Grant! Also, welcome back John Marler, Kristina Lange, Hadley Robertson and John Woodward, who had as crew his son John. Welcome newcomers, Jeffrey Feingold, Hadley’s father, and Amy and Megan Davison. The top finishers, Steve Shepstone, Chris Lane, Brant Davison, Melissa Shepstone, Richard Smith and Jim Kohler kept trading places during the races. At one point, Steve threaded his way between two starboard boats. Richard, who was very close behind, could not follow and Steve took a wide lead. As you can see from the results, Steve won the day with three first-place finishes. Steve, Melissa and Jim are world class sailors winning worldwide competitions. As usual, I was not close enough to the leaders to really see what was going on. I was dueling it out with 12-year-old Danny McCafferty and cohort Tom O’Shea, and Peter Martini. In the heat of battle, one sailor who shall remain nameless yelled “starboard” when she was on port tack but a collision was avoided anyway. Many thanks to the Race Committee consisting of Commodore and Sallie Bethge, James Wittaker and Debbie Davidson. Debbie operated the chase boat until the outboard gave out. They did a superb job, considering some of the boats did not have numbers and sails look alike. Sailors, remember to come alongside the committee boat and give them your full name and sail number before the start of racing each week. An awards banquet was held at Commodore and Sallie Bethge’s after racing. The Bethge clan did a wonderful job. The Windels Memorial Trophy was awarded to Jim Kohler for winning the first race of the season. Jim owns the Dinghy Shop and since he is the MYC member who normally engraves the winner’s name on the Windels Trophy, this year he gets to engrave his own name on it. After the awards presentation, we all enjoyed a great barbeque and tall stories of the day’s events. We all have a great time at the races. 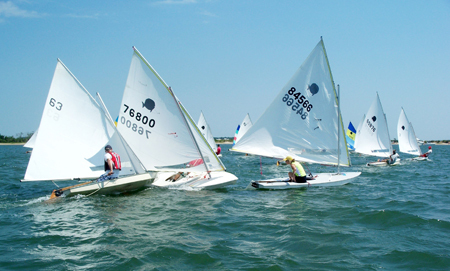 Come one and all, novice to expert, at 2 p.m. every Sunday through Labor Day in West Neck Harbor. Pete Bethge has several boats to lend out on a first to reserve basis. Call Bob Harris at 749-0524 or Pete Bethge at 749-1297. See you on the water. COURTESY ROBERT HARRRIS | Sunfish racing by members of the Menantic Yacht Club. The Menantic Yacht Club (MYC), a club with no dues or fees and open to all sailors, from novice to expert began regular weekly Sunfish racing for the season today. Races will continue through Sunday, September 2, starting promptly at 2 p.m. in West Neck Harbor. Sailors may just show up ahead of time and give their full names and sail numbers, if they have one, to the Race Committee. The club usually holds five races around a triangular course each Sunday but the committee will determine the exact course prior to each race. BETSY COLBY PHOTO | The Menantic Yacht Club Sunfish fleet in its fourth race of the season on Sunday approaching the windward mark in West Neck Harbor. 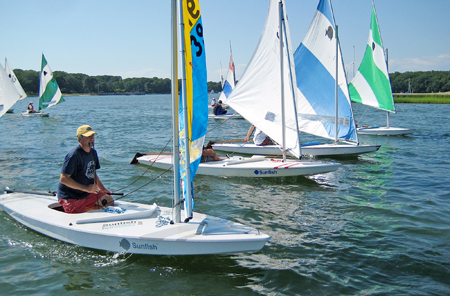 The Menantic Yacht Club (MYC) held its fourth series of Sunfish races Sunday, July 24 in West Neck Harbor. Mother Nature threatened rain but it only sprinkled before the races began. Fortunately, the heat wave of the previous days had broken and with the lower temps we at least had some wind — not much but some. It was from the north northeast at between 2 and 6 knots. The Race Committee held five races, three around the triangle course and one the triangle plus windward with downwind finish; the fifth race was the triangle plus windward, leeward finish. The windward mark was placed towards shore just off Montclair Colony by the house on the point. The wind at that location, when we had it, was extremely squirrelly, causing traffic jams and boats to hit the mark. But it made for excitement and some good sailing. At one point, I was approaching the windward mark on starboard tack with Penny Pilkington in front and to windward of me along with several other boats. Just when I thought I was not going to make the mark and would be in serious trouble, Melanie Coronetz became entangled in the mark and dragged it along with her. With the mark so conveniently moved, I was able to make it around in front of all the other boats. Thanks Melanie, because of you I did not finish at the back of the pack in that race. 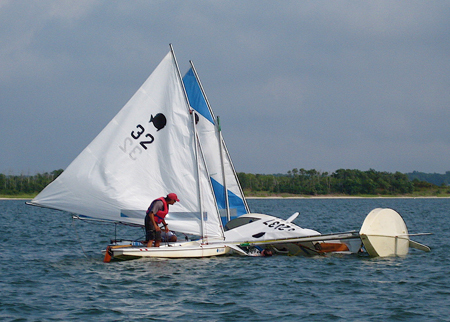 Eighteen sailors on 15 Sunfish participated on Sunday. Rick Dalton and daughter Rebecca shared a boat. John Woodward shared a boat with his son John and John’s friend Oscar Champgneulle and Gavin Trepeta shared a boat with his brother Cooper. Welcome back, Gavin. Hopefully the boatyard gives you more Sundays off. Speaking of brothers, we had a sibling rivalry between Charlie and John Modica on Sunday. At one point between races, Charlie, in jest, asked John if he was still racing because Charlie had been so far in front that he wasn’t even able to see John. However, as you can see from the results, Charlie just slightly beat John. Good racing, guys, but Richard Smith was the sailor to beat. The results do not do justice to four sailors. An hour before the start of the race, Charlie, along with Andy Belford, had to race over to Old Saybrook, Connecticut in a power boat to pick John up when John’s boat would not start. As a result, they all missed the first race but still performed exceptionally well. Bill Martens also missed the first race. For most of the day, Richard Smith and Charlie were dueling it out far in the lead. Richard sailed so well that even after doing a 360-degree penalty turn, he gained a lot of ground, coming in fourth, right behind me in one of the races. Commodore Pete Bethge told me after the racing that he had witnessed a number of sailors commit infractions and then not do his or her 360. Maybe we should all make it a point to obtain and read the rule book. My guess is that most of us do not know when we cause a foul. I hope that is the reason, anyway. At the start of one race, I was forced into the committee boat. Three or four boats were leeward of me but the rule states that if the windward boat cannot avoid the committee boat then the leeward boat cannot force the windward boat up and into the obstruction. All the boats to leeward were at fault but they may not have known the rules well enough to realize that. Luckily, no damage was done to the commodore’s boat. A number of regulars did not show this week but most had acceptable excuses. Peter Lane took his son Jack to Marblehead racing. Jack has been performing well this season. Linda Gibbs and Tom McMahon were attending a historic wedding at Gracie Mansion. Cristina Morris loaned Victor Diaz her boat so he could race in the nationals. I have to wonder if she is going to get some lessons in exchange. Mary Vetri was visiting family. But where were you, Danny McCafferty and Rita Gates? The Race Committee consisting of Commodore and Sallie Bethge and Betsy and Marnie Cole did a superb job as usual. Betsy, we were glad you were there, but where were Cole and John? Remember sailors, come up alongside the committee boat and give them your full name and sail number before the start of racing each week. There will be a cookout next week after the races at the home of Charlie and Lynn Weiner, who are avid supporters of the MYC even though they don’t race. Please call Pete Bethge if you plan on attending. The MYC is a friendly club open to any and all sailors, novice or expert. Just show up by 2 p.m. in West Neck Harbor and join in the fun. We have a number of extra boats available on a first-to-reserve basis. Call Pete Bethge at 749-1297 or Bob Harris at 749-0524 to reserve a boat. See you on the water! 1 point for first place, 2 for second, etc.